I’m not a big fan of non-direct promotional strategies. In my recognition, when you’re deciding to promote your product, you do it openly, avoiding cheap tricks – in this case usage of non-conventional marketing vehicle, i.e. placing your ads where receivers are not expecting to see them. It is a matter of treating your potential customers in a honest way. Such strategy has a great potential of backfiring, and turning back against its creators – in this case both involved parties. I have nothing against sponsored articles, but only when they’re placed in the proper section of a credible newspaper, and are also promptly marked. Los Angeles Times has lost somewhere the first condition. Southland takes a “raw and authentic look” at Los Angeles and the lives of the LAPD officers who police it. The show’s seven episode first season centers around the experiences and interactions of LAPD patrol officers and detectives, and is less a police procedural than a character-drive drama. Among the characters are Off. Ben Sherman, a rookie cop and his openly-gay training officer, John Cooper, Off. Chickie Brown, who aspires to be the first woman on the elite SWAT Team , dedicated Detective Lydia Adams, and Detective Sammy Bryant, whose home life interferes with his working life. NBC says it is taking care not to deceive readers; the story is in different style than the paper’s normal content. It appears in a smaller typeface, and is also marked as an advertisement. So, everything looks ok, right? Ordinary content can be divided from the ad, but I’d really want to see a research detailing how large fraction of readers did so. I’m not pointing in the so-called ignorance among US citizens, a point of view so popular in Europe. Stupidity, or shallowness are universal, and completely border free. There is a significant portion of people who have problems with dividing reality from i.e. television stories. So many times actors who’re playing popular characters are complying that they are not being recognized as themselves, but rather as who they’re playing. People are also i.e. copying the patterns of behavior from their favorite series. Borders between reality and affectation is melting, and while this can be a great marketing opportunity for promoting (like product placement once had been), it is tricky and dangerous for the content providers. Trust is the most precious value achieved especially by a media company. As precious it is, as easy it is to loose. 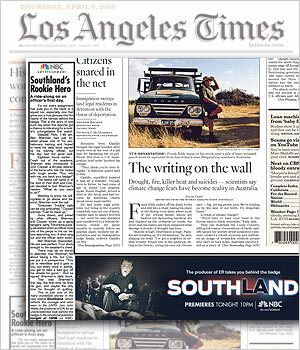 Los Angeles Times Southland case should be a firm warning, and the ultimate border. For NBC – it didn’t backfired at all, as if people didn’t combined heroic rookie with their series, maybe they will at least remember the main character name, which will benefit for the station. If they did combined, they had just felt a bit confused, and were rather angry for a newspaper, not for NBC. But it could’ve been worse. Innovative, and if properly used very beneficial for a company which uses it for a promotion. Potential of backfiring and damages in the image of both parties involved. Hurts credibility of chosen media. More on the subject in Variety. 26 zapytań do bazy. Strona wygenerowana w 0.203 sekund.